So on a recent sunny summer day I decided to visit a raptor sanctuary for injured birds of prey with one of my girlfriends, who had just informed me of its existence. 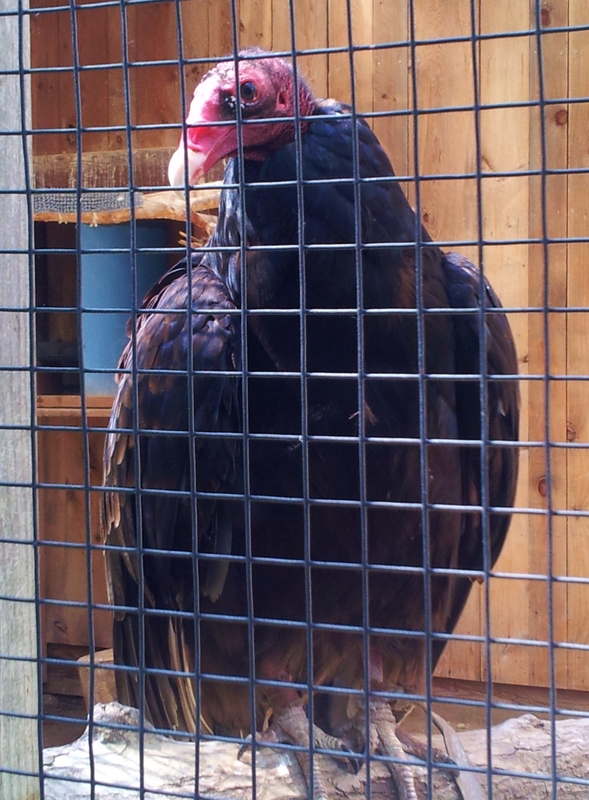 The avian inhabitants are all birds that cannot survive in the wild due to injury, and they have many stunning creatures on display for public education including owls, hawks, falcons, a Raven, a Bald Eagle, and my personal favorite…a Turkey Vulture! For whatever unfortunate reason, this majestic creature has been maligned by detractors who insist upon dismissing them as buzzards; adamant they are naught but ugly, beady-eyed, scavenger opportunists while demonstrating obvious disrespect for the Medicine they bring. So let me rebut this notion by telling you all about my new buddy who, when he saw me standing near the edge of his enclosure admiring his next door neighbor the Bald Eagle, made a beeline over to the corner closest to me to say hello! My friend proved a highly interactive critter, standing right in front of me and preening his glossy midnight-blue feathers edged in brown as if to impress. He even went so far as to display for me, his huge wings casually spreading out in the morning sun for several long, lingering moments with an utterly nonchalant expression in his eyes; the virtual vulture equivalent of saying “Two tickets to the gun show right here!”, LOL – he seemed to be quite proud of himself and wanted to show off the goods! He was quite the charmer, and when I tried to move on to visit with his other neighbor – the Raven – he followed me to the very edge of his enclosure and flapped his wings in order to get my attention. When that didn’t quite work the way he wanted it to he resorted to flying onto the fencing and clinging to it with his large talons, beating his wings noisily to call me back over. I obliged, of course, and returned to his side to converse with him some more. When he continued this behavior despite my (renewed) close proximity, I thought that maybe it was a potential indicator that he wanted me to pet him; perhaps appreciating an opportunity to connect on an even deeper level. So the next time he grasped the sides of his pen and began flapping, I reached my index finger through the cage to gently stroke his chest. He seemed quite pleased with this…vultures need love too, ya know! Touch can create such a powerful energetic exchange between the parties involved…it doesn’t matter if they are human or animal. I think all sentient creatures crave this kind of contact on some level; albeit to varying degrees. It is a mark of trust, IMO, and I feel honored that my new friend graced me with this privilege! ‹ PreviousBorn To Run? Jon Stewart Does Saturn!